The Nats lost to the Giants 9-5 on Friday, but of bigger concern was Stephen Strasburg who left the game after two innings because of tightness in his right shoulder. 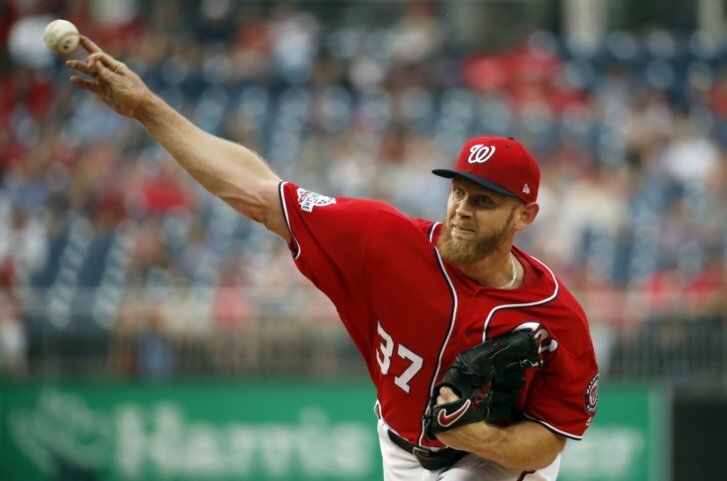 WASHINGTON (AP) — Nationals pitcher Stephen Strasburg has spent time on the disabled list during each of the past three seasons. The Nats are hoping he doesn’t make it four in a row. Strasberg exited after two innings because of tightness in his right shoulder, and the San Francisco Giants rapped eight extra-base hits to beat Washington 9-5 Friday night. “Today it acted up on me a little bit more than the other ones and Davey decided to pull the plug,” he said. The 29-year-old Strasburg has been excellent when healthy, going 15-4 in both of the two past season. But he hasn’t made 30 starts in a year since 2014 when he made 34. Andrew McCutchen and Gorkys Hernandez homered for San Francisco, which collected 15 hits, including two doubles by Brandon Crawford. Rookie Juan Soto hit a two-run homer, his third in 17 games, in the Washington fourth. Bryce Harper’s two-run single in the fifth pulled the Nationals within 6-4. Staked to the early lead, Giants rookie Andrew Suarez couldn’t finish the fifth and was lifted in favor of Moronta after Harper’s hit. Suarez allowed four runs on six hits in his ninth start. Matt Adams’ pinch-hit single in the sixth pulled Washington within 6-5. In the second inning, the first four Giants went double-single-double-single off Strasburg, with Alen Hanson and Pence driving in runs. The Stanley Cup Champion Washington Capitals, along with the Cup, will be at Nationals Park on Saturday. The team will be introduced prior to the game and Capitals captain and Conn Smythe-winner Alex Ovechkin will throw out the ceremonial first pitch. Giants: RHP Johnny Cueto (right elbow inflammation) and RHP Jeff Samardzija (right shoulder tightness) threw bullpen sessions. Bochy said Samardzija will throw one more bullpen and then throw to hitters or make a rehab start. Cueto said he would like to throw two more bullpens and then a batting practice. Nationals: OF Adam Eaton (left ankle surgery) is close to being activated. He went through a full pregame workout with the team and could be in Saturday’s lineup. … 2B Daniel Murphy (right knee surgery) continues his rehab assignment at Double-A Harrisburg. “We want to get him comfortable playing maybe three or four games in a row, so we’ll just see,” Martinez said. Giants: Rookie RHP Dereck Rodriguez (1-0, 1.93) makes his second major league start. Rodriguez is the son of Hall of Fame catcher Ivan Rodriguez, who finished his playing career with the Nationals. Nationals: LHP Gio Gonzalez (6-2, 2.27) is 5-5 with a 3.21 ERA in 13 career starts against the Giants.